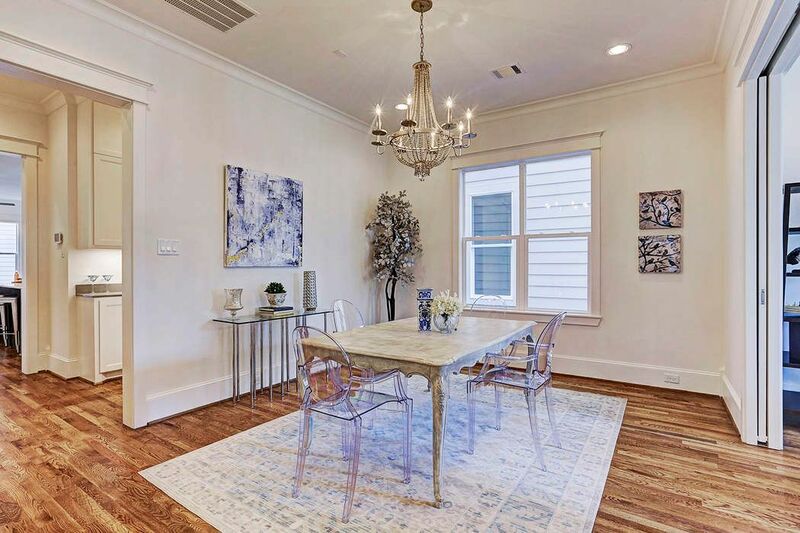 444 West 17th Street Unit B, Houston, TX 77008 | Martha Turner Sotheby's International Realty, Inc.
444-B West 17th Street is another premier property located in the Heights being offered by the distinguished builder, Smith Family Homes. 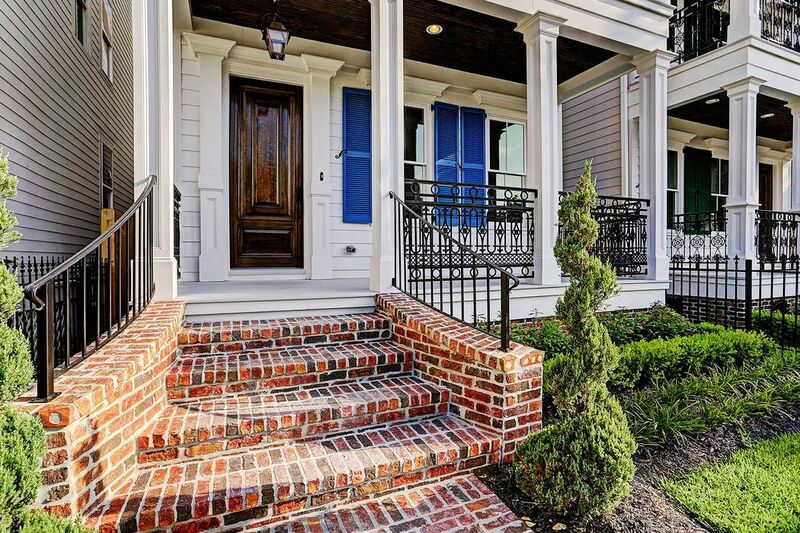 As you approach the reclaimed brick stairs, a handsomely stained, solid wood door is the focal point on this inviting front porch. 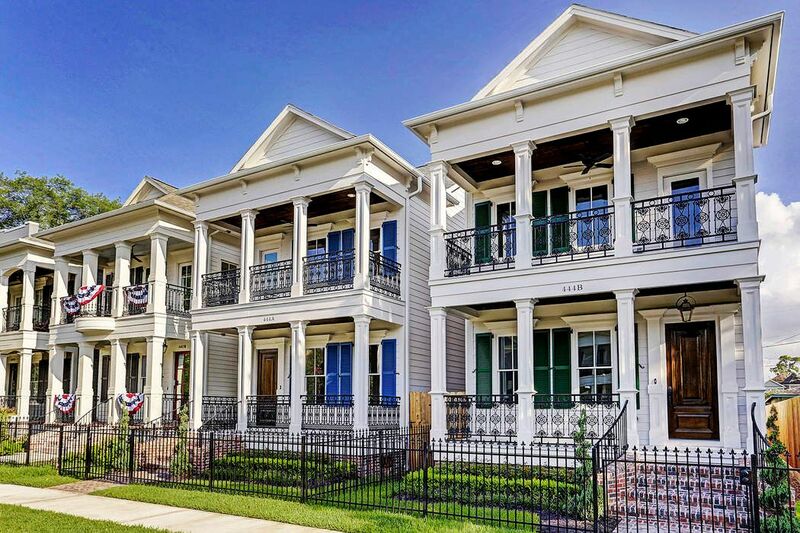 Pictured is the front porch of 444-A with blue shutters while 444-B has green shutters. 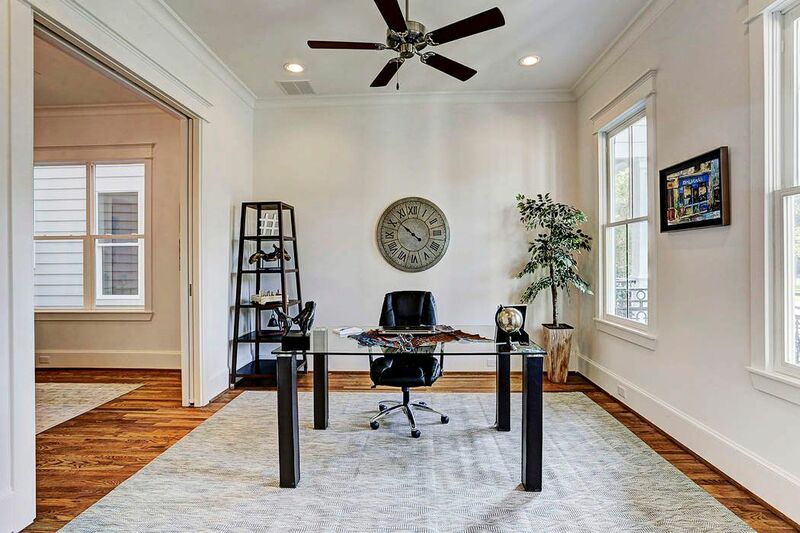 Crossing the threshold of this 3,578 square foot home, the quality of construction is immediately noticed with amenities such as Emtek door hardware. To the right of the entry hall is this 12' x 12' room. Pocket doors with fully cased openings provide a hint of formality. Currently presented as a study, it can also be utilized as a sitting room, music room or formal living area. Another view of the study shows the north facing Jeld Wen windows that overlook the front porch and gated front yard. 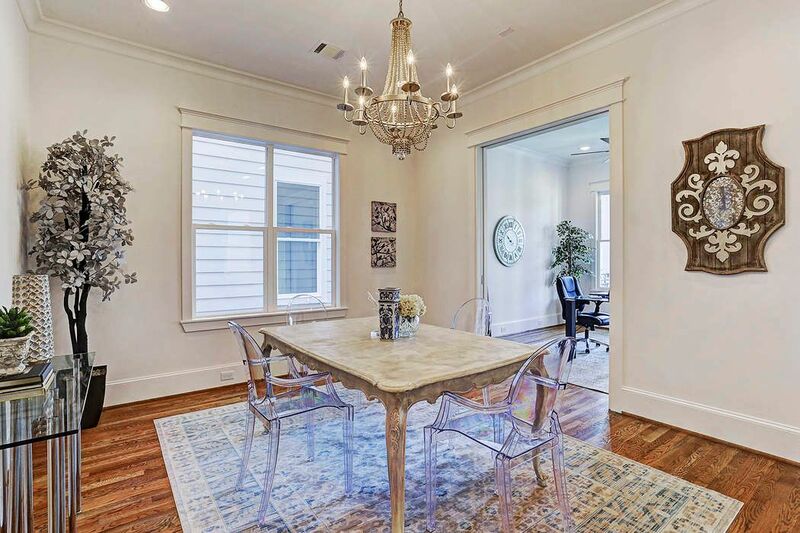 The dining room is centrally located and has an elegant 8-light chandelier. This room is pre-wired for speakers. The kitchen and living room were designed with perfect proportion while Jeld-Wen windows allow natural light to flood the room. 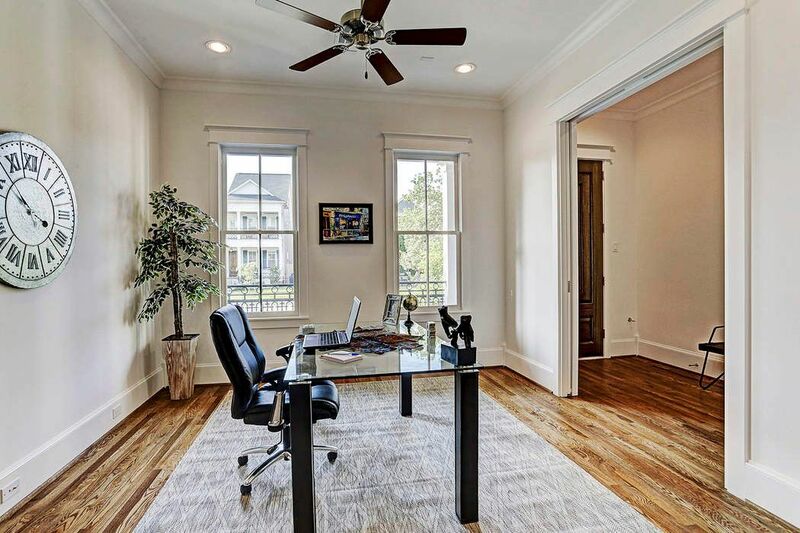 Other details worth mentioning include 10' ceilings with crown molding. 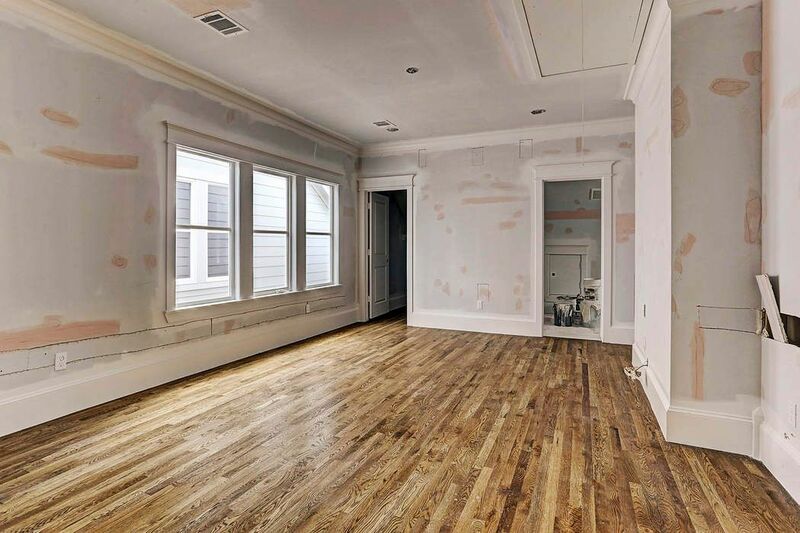 Pictured is the kitchen from 444-A W. 17th St. The 19' x 14' living room is pre-wired for 5-channel surround sound. 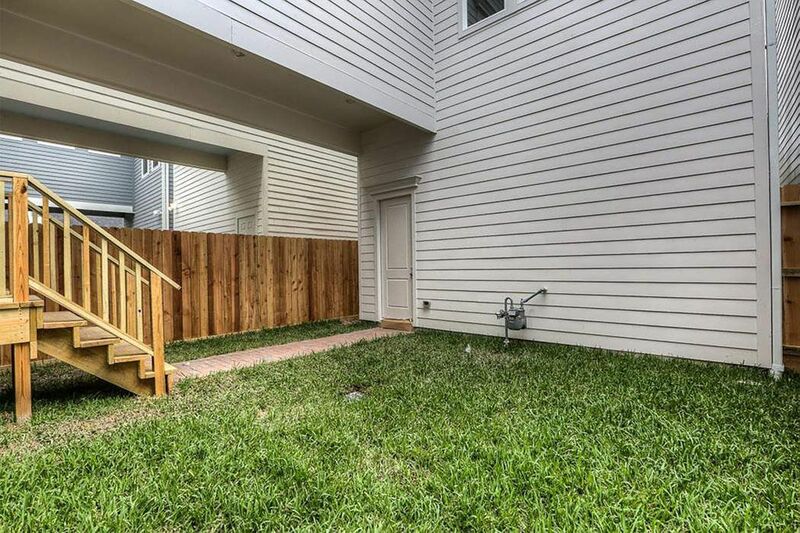 The door just beyond the sofa leads to the secluded backyard. 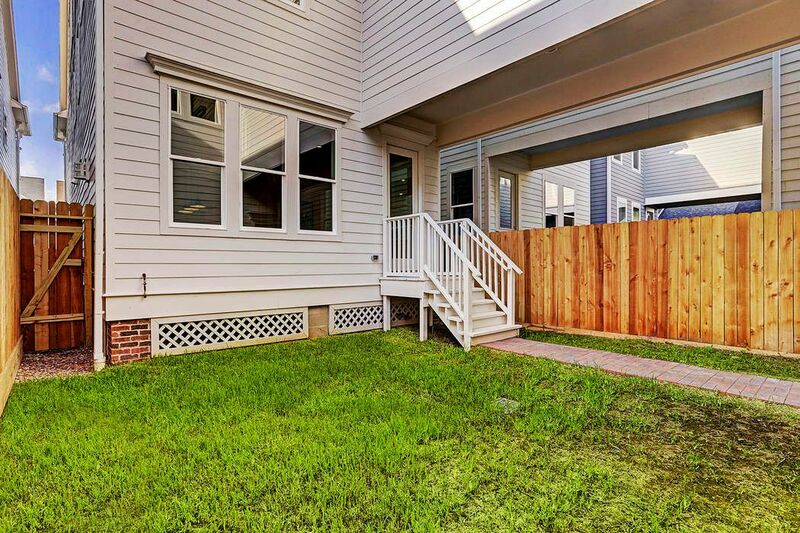 The breezeway connecting the garage to the living room helps to keep you dry on rainy days. Pictured is the backyard from 444-A W. 17th St.
Another angle of the backyard shows that the home is pre-plumbed for a gas, outdoor kitchen/grill. Pictured is the backyard from 444-A W. 17th St.
From this vantage point you are able to appreciate the scale this home affords. The gas log fireplace with stone surround act as the focal point of the living area. 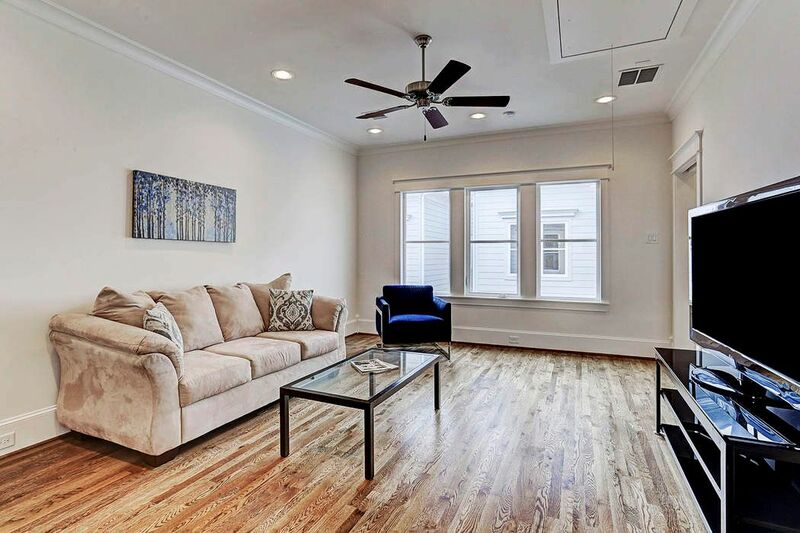 Throughout the home, excluding the bathrooms, are 2 1/4" oak floors with a warm Weathered Oak finish applied. 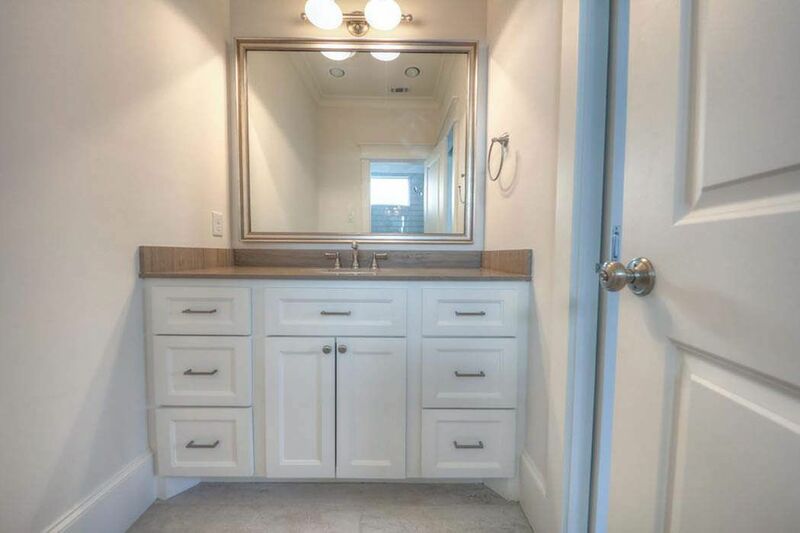 In the far corner is a perfectly sized coffee bar with undercabinet lighting. Another view of the 19' x 11' kitchen blending well with this magnificent space. 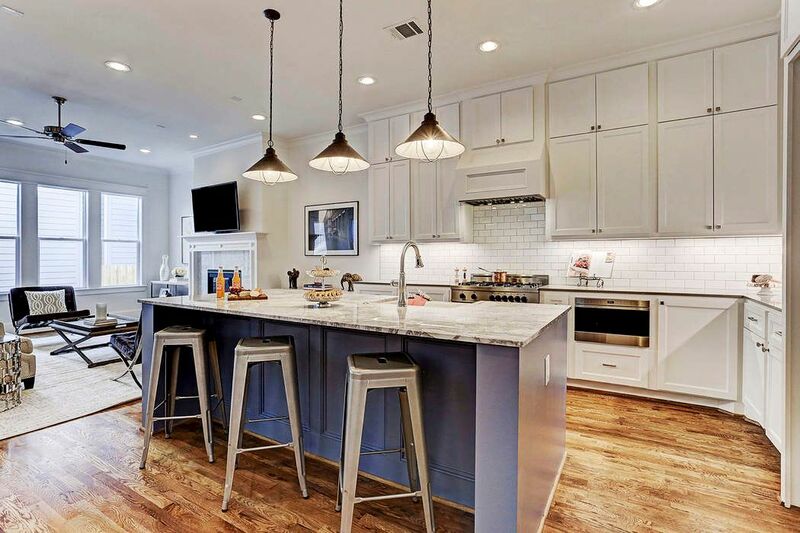 The oversized island has a marble slab, soft close, full extension drawers and an appliance package that includes a Bertazzoni range, Wolf microwave & Bosch dishwasher. 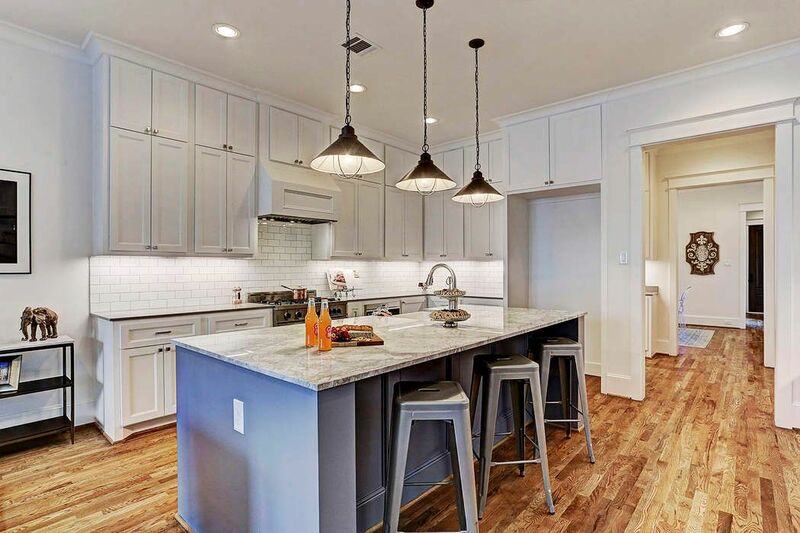 Conveniently located between the kitchen and dining room is this elegant dry bar and walk-in pantry. 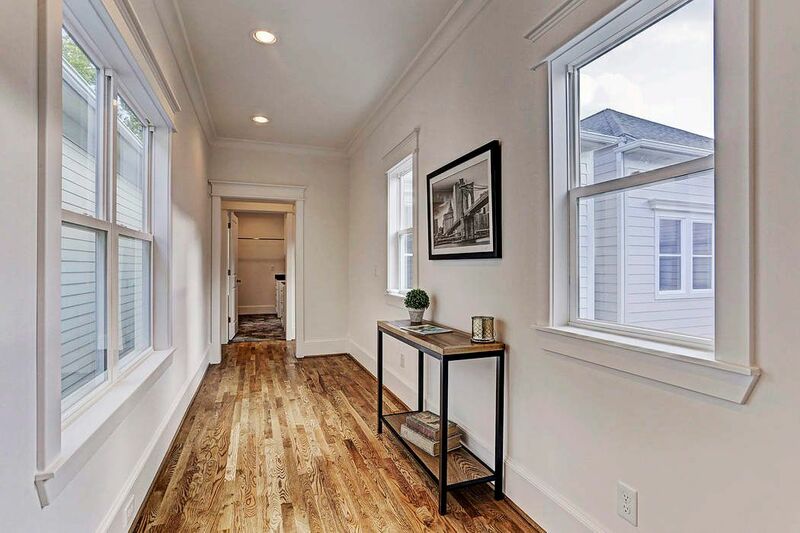 Little details such as baseboards with electrical plugs integrated into the trim is yet another example of superior construction that continues to raise the bar. The 18' x 14' master suite continues the 2 1/4" oak floors. 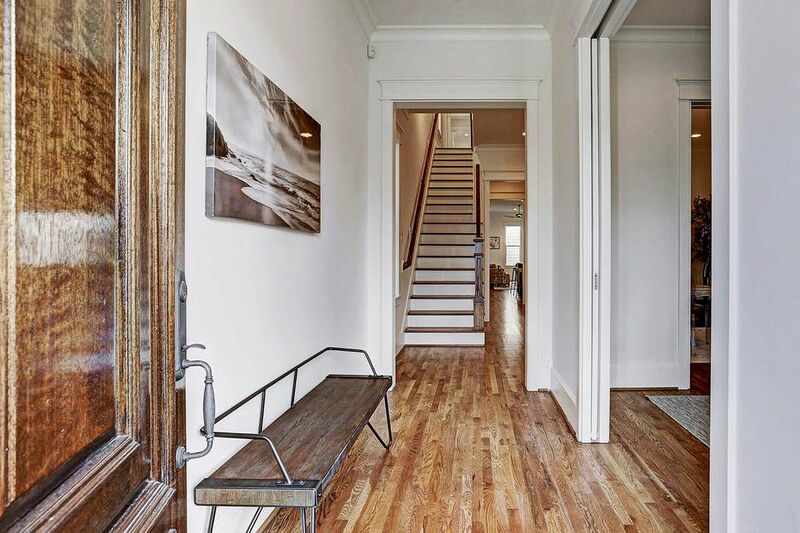 The door to the right leads to the private master terrace deck. 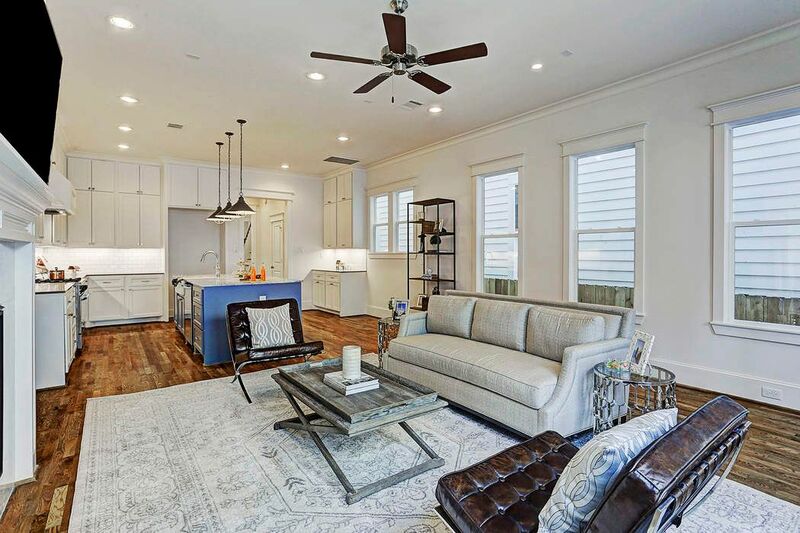 Whether you desire to enjoy a morning beverage or a night cap, the porch has a ceiling fan to help to circulate the air as you are provided with north facing views. 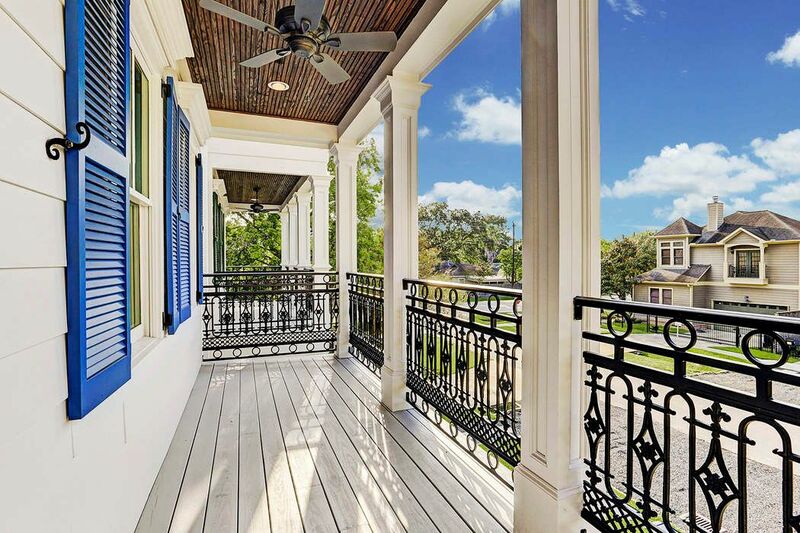 Pictured is the front porch of 444-A with blue shutters. 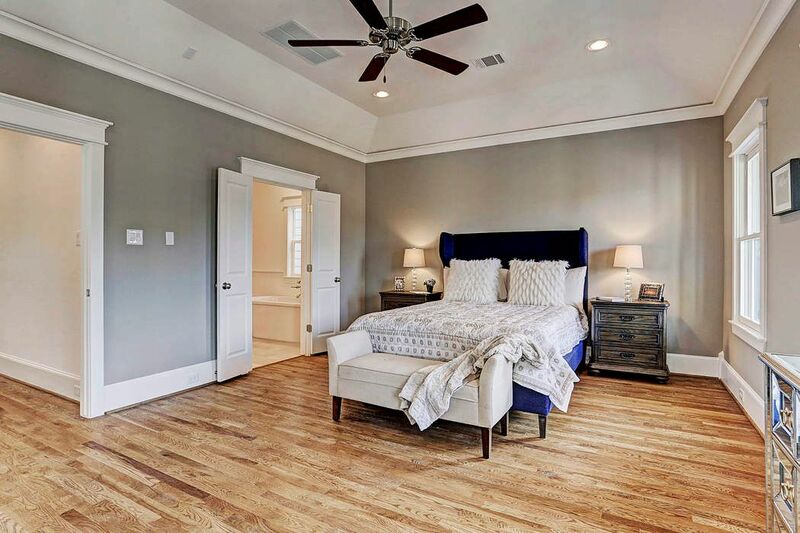 The vaulted ceiling is pre-wired for sound and a very agreeable hue of Sherwin Williams paint was chosen by the designer for the master bedroom. 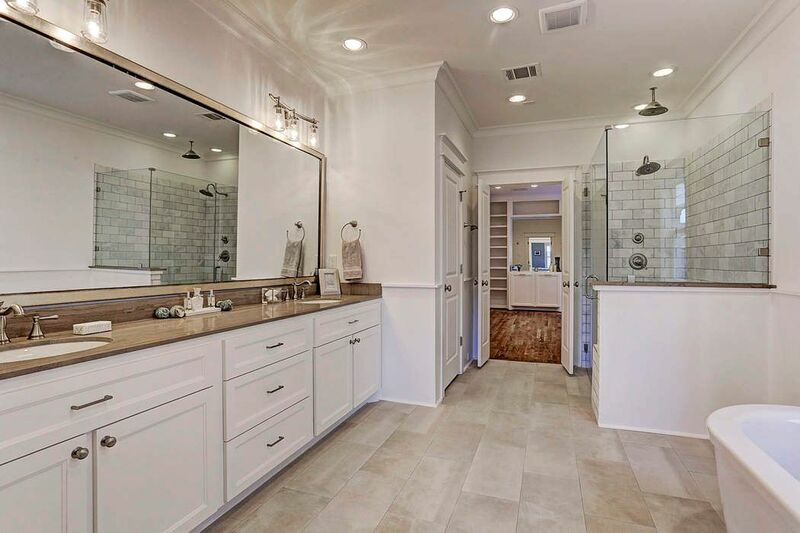 The freestanding tub to the right is on display like a piece of art. The 10', dual sink vanity has amazing stone counter with a beautiful full sized mirror perched above. Opposite the shower is the private water closet. 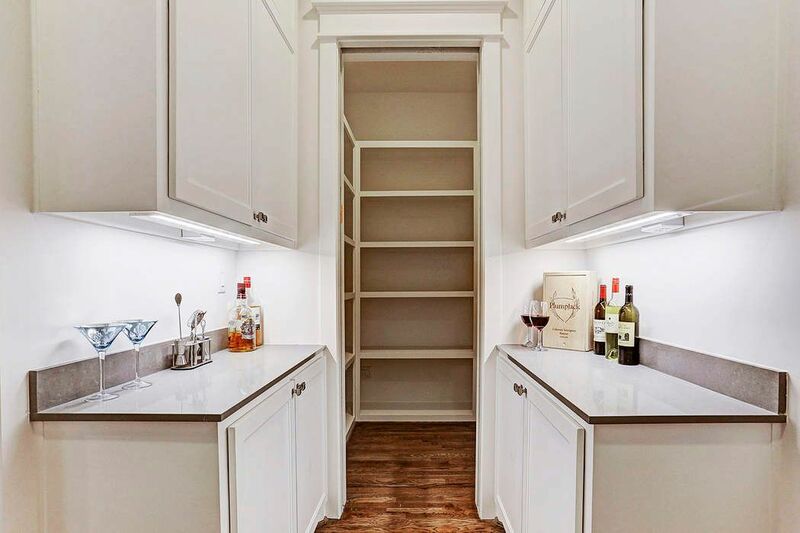 Measuring approximately 150 square feet, the master closet has custom cabinetry with full extension, soft close drawers and dual hampers that allow clothing to be easily separated. 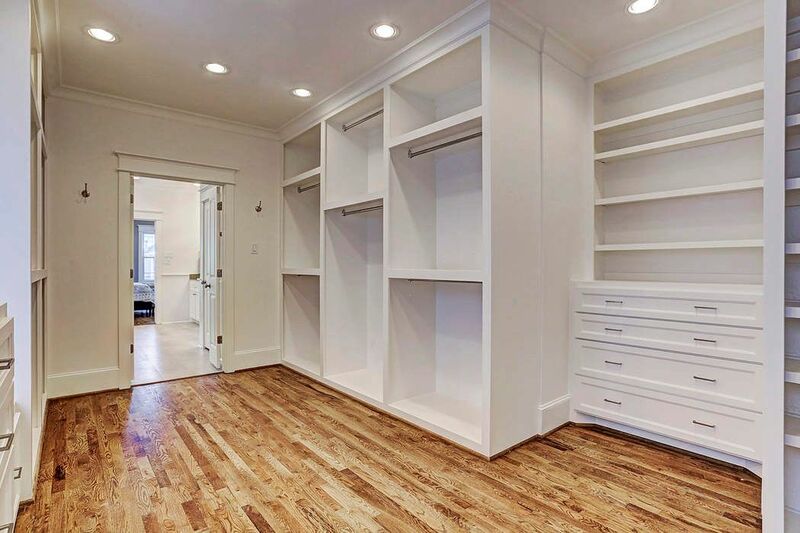 Another angle of the master closet shows the abundance of space that is usually exclusively reserved for seven-figure homes. The shower with with dual heads (wall-mounted and rain dome) is behind the frameless glass shower enclosure. This secondary bedroom measures 12' x 12' and is situated in the middle of the home. Dual, south facing windows overlook the backyard. 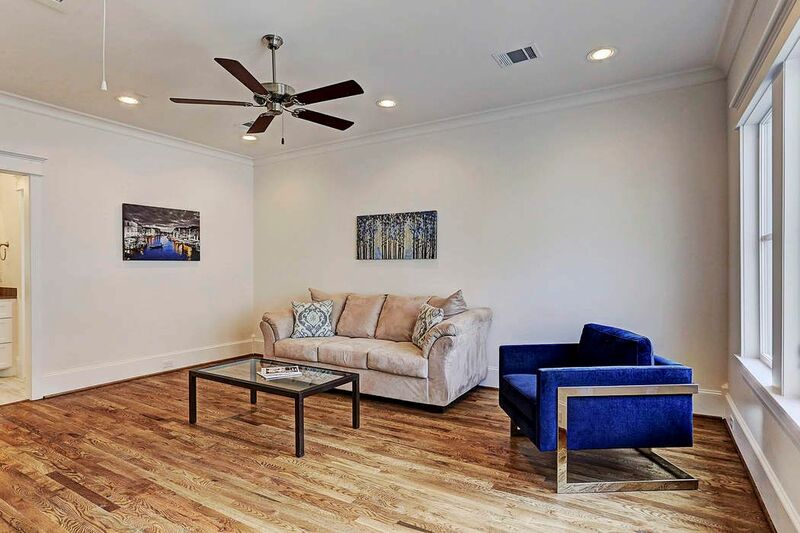 The 52" Emerson fan is another high-end product found throughout the home. The ensuite bath for this bedroom also has travertine counters and satin chrome plumbing fixtures and door hardware. 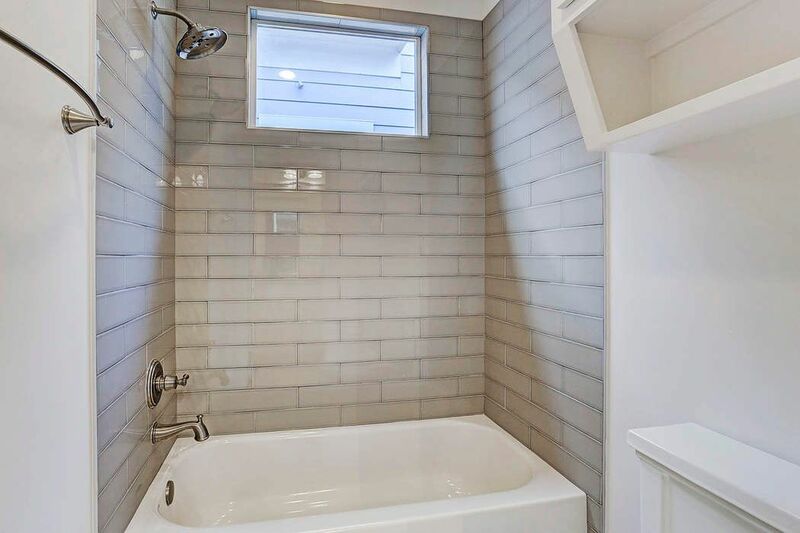 Beautiful, oversized tile in the subway format complement the tub enclosure with its large showerhead. The hallway leading from the master suite to the rear bedroom and utility room has windows on either side allowing an abundance of light. The rear bedroom measures 18' x 14' and could easily be used as an upstairs den/tv lounge. The ensuite bath has the same, beautiful finishes found in the other secondary's bedroom ensuite bath. 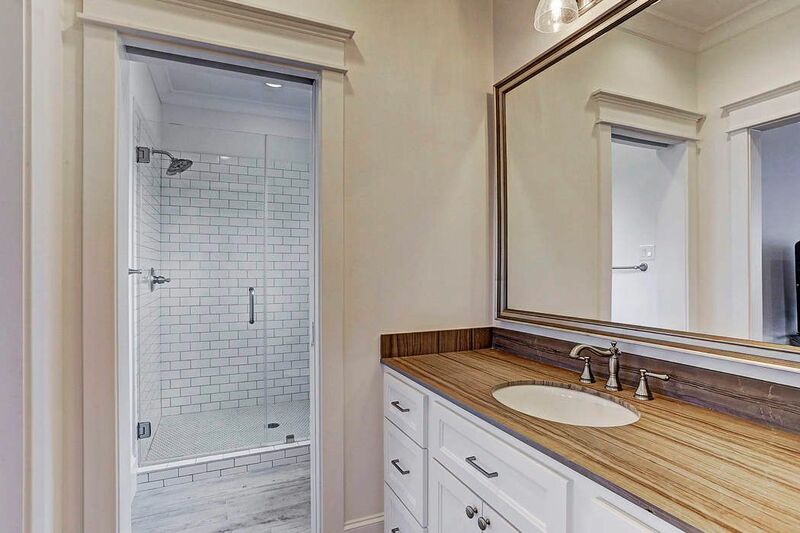 A large walk-in closet is behind frame, while the commode and shower enclosure have a door for additional privacy. Another view of the rear bedroom with north facing windows overlooking the backyard. 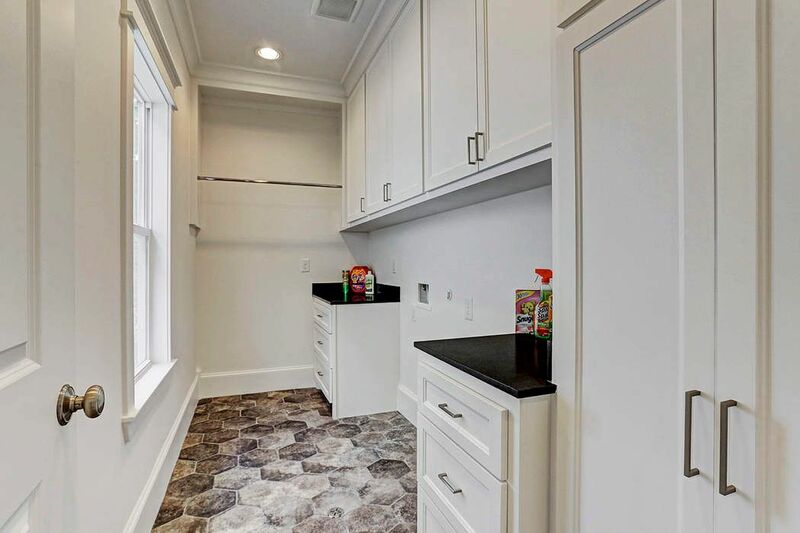 The utility room has capacity for a side-by-side, full-size washer and dryer, dual vanities and a hanging rod for additional functionality. 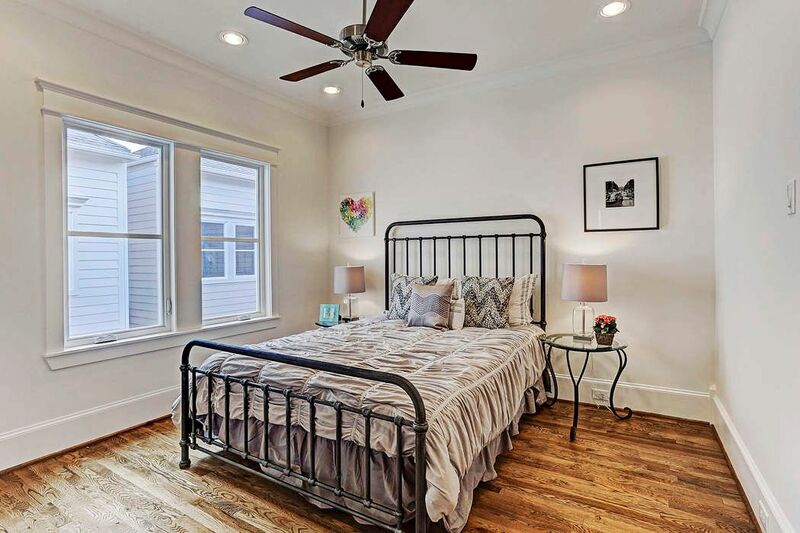 To help ensure that you never outgrow this home, Smith Family Homes took the time to prepare the third floor for additional room to enjoy. 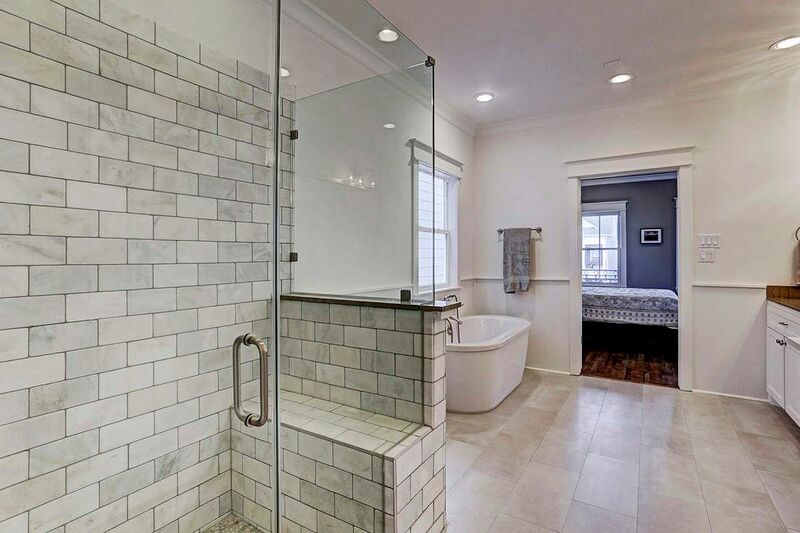 The bathroom can be finished out to the buyer's taste, if desired. $834,950 USD 3 Bedrooms4 Full / 1 Partial Baths3,578 sq. 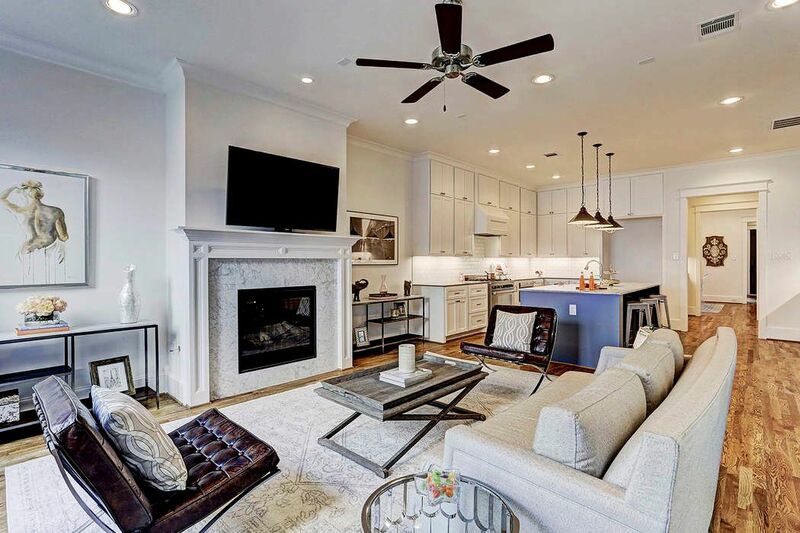 ft.
An extraordinary example of another Smith Family Homes property that features high level finishes such as quartzite counters, stainless appliances, hardwood floors and oversized Jeld Wen windows. 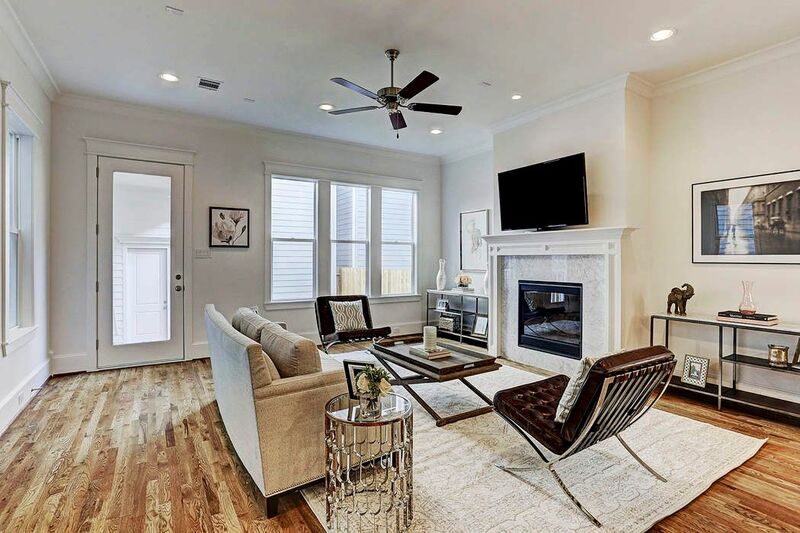 First floor living areas are highly functional and perfect for any age. 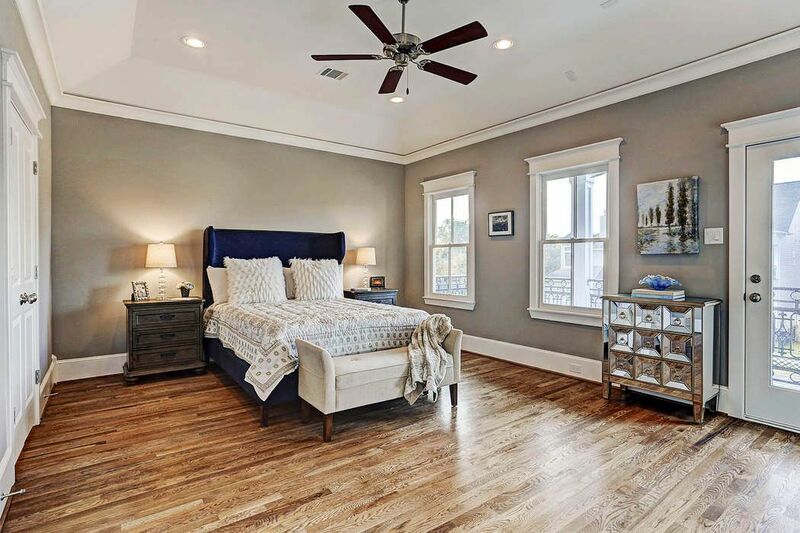 On the second floor to go along with two other bedrooms, the master suite is unlike no other with a private terrace deck, spacious bathroom and a closet typically found in homes twice the size. The third floor provides a fourth bedroom/game room.